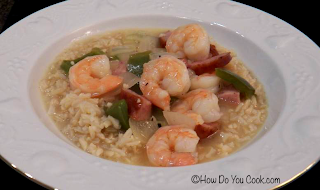 As we continue along into Soup Month 2012, for day 12 we made a Shrimp and Kielbasa Sausage Gumbo that was remarkably light. The Cajun-inspired flavors of the sausage and shrimp combined with vegetables and just a touch of cayenne powder, launched this dish into an instant family favorite. The base for this gumbo begins with what Cajun cooks call the Holy Trinity, bell peppers, onions and celery. These 3 simple ingredients are the starting point for many Cajun dishes, especially Gumbo. To keep the dish as healthy as possible, try to find nitrate-free kielbasa or smoked sausage or you could substitute turkey sausage. The Gumbo is served over a bed of brown rice for a delicious complete meal. Total prep time for this meal is only about 15 minutes and cooking time is around 25 minutes. This dish also makes great leftovers! Enjoy!! In a large soup pot, heat oil over medium-high heat. Add the pepper, onion, celery, garlic, cayenne, thyme and salt and pepper. Stir to evenly coat the vegetables and cook over medium-high heat for 3 - 5 minutes or until softened. Add the sausage to the pot, stir, and cook for 5 minutes until the sausage begins to brown around the edges. Sprinkle the sausage and vegetables with the flour, stir to coat, then add the chicken stock and simmer for 10 minutes. Add the shrimp to the pot and simmer for about 3 minutes or until the shrimp are pink and cooked through. Serve over a scoop of brown rice.